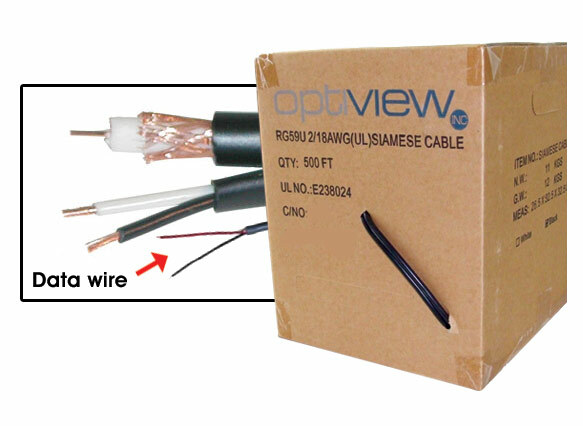 This RG59 Siamese cable combines the video coax cable with 18 gauge 2 conductor (18/2) power wires, and 24 gauge 2 conductor (24/2) data cable. The data cable can be used to run audio or for PTZ camera control. The coax is top quality 95% copper braid and can be run up to 1000 ft. Cable comes on a reel in a convenient pull box allowing a continuous tangle-free feed. This is the ultimate CCTV cable! As advertised: the cable is excellent quality and feeds from the box smoothly. The order arrived promptly.